Photo taken in Kitchener Ontario, most likely an engagement photograph. Emily Gilby was born 1844, and came to Canada in 1850, to Sheridan in Trafalgar Township, Halton County. Her parents were John and Alisemon (or Alisimon) (Straw) Gilby. Her close sister was Emma. 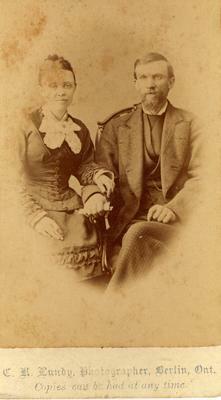 Emily married George Hardy on January 25, 1872. She died in 1936. George Henry Hardy was born in 1843 and died in 1933. George and Emily are buried in Springcreek Cemetery, Clarkson Road North, Mississauga, Ontario. You can find their inscriptions by searching www.findagrave.com, under Springcreek Cemetery, Missisauga, Ontario. Family member Neil Hoover has created a website, linked here with his permission, so you can explore the Alton, Hardy and Wilson family heritage further. Click on the link "Alton-Hardy-Wilson" to the right in this record to see the extensive information.